AppleInsider checks out Marshall's Stanmore and Action multi-room speakers to test out if they are solid options for the wireless speaker fan, even if they only support only the original AirPlay. These speakers were added alongside Marshall's existing Bluetooth models, making the decision that much more difficult for potential buyers. All of Marshall's speakers share similar aesthetics, a bold retro design to complement the impressive sound that they put out. Of all their multi-room speakers, of which there are three models, we played with the smaller two of the three - the Acton and the Stanmore. Not included in this review is the Woburn, though we've spent plenty of time with the non-Wi-Fi version of the Woburn in the past. We can touch on that a bit later when we get to audio quality. Though the exterior may be vintage-inspired, inside it is all new. Each speaker has a wealth of different inputs making them great to use with or without a host device to stream from. To kickoff our review lets take a look at the build quality and design of these powerful speakers. Without a doubt, the design of these speakers can be polarizing. Some people just may not go for that nostalgic design invoked by Marshall's speakers. For us, we love it. It takes us back to all the live concerts we've gone to with countless oversized Marshall amps gracing the stage. Live music is something we're very passionate about and it is hard not to get that feeling when kicking back and listening to our favorite jams over one of their consumer-targeted home speakers. Similarly to those giant amps, Marshall's speakers aren't small or light. When compared to many other in-home Wi-Fi or Bluetooth models, any of Marshall's will be larger and weigh more. Acton is the smallest, with roughly the same height as HomePod and twice the width. Since these aren't designed to be portable, we didn't have too many qualms with this. The larger size just helped them standout. The exteriors are made of the same rubber material used on Marshall's larger stage-destined amps, giving it a bit of a soft touch. On the bottom, four rubber feet help dampen any vibrations that may emanate from playback. Marshall's iconic scripted wordmark graces the front atop a screen that covers the array of woofers and tweeters that reside inside. Gold/brass are used frequently as accents, such as on top of the logo, around the front, and liberally along the top. Speaking of the top, that is where a mess of controls are found above a metal plate. Metal knobs with knurling are used to adjust the volume, treble, bass, and input. They provide a great tactical feel, with just the right amount of tension when adjusting. A tiny toggle button is used to switch between multi and single modes, depending on your use cases. Lastly, on the right, are a pair of previous/next buttons to use during playback. Marshall's multi-room speakers have between five and six inputs depending on the model. Both the larger two (Stanmore and Woburn) have RCA, but the rest all share Chromecast, AirPlay, Bluetooth, aux, Spotify, and 3.5mm options. A knob on the top can be used to change inputs, as can the accompanying multi-room app. Using the app, seven presets can be programmed as well to correspond to the favorites on the input knob. Spotify playlists or internet radio stations can make up these favorites. Those RCA inputs can be useful but would be hard to use in a home theater environment. Even the Stanmore, the smallest with RCA, is far too large to act as a soundbar. A more appropriate use for these inputs would be for another music device such as a turntable. Even though these speakers have AirPlay, a great convenience for Apple users, they do not currently support AirPlay 2. Interestingly, while Marshall was among those listed as backers of AirPlay 2 on stage during the announcement, they've yet to commit to bringing AirPlay 2 to any of their devices. When pressed for comment, Marshall said their speakers "are made to be interacted with directly through the controls on the speakers, rather than having users be dependent on their devices. Because of this, and because we already support multi-room playback using any input as a source - including AirPlay - we are only at this point exploring AirPlay 2, but have not made a decision if we will implement it in our product assortment." This statement is true, they do have their own multi-room technology that works very well, it won't be enough to appease many users. AirPlay 2 isn't just about the ability to stream audio to different rooms simultaneously, though of course, that is a large part of it. AirPlay 2 also increases the buffer, reducing the drops in audio that occasionally happen. It also makes them part of HomeKit, allowing Siri to control music playback, stream Apple Music, and possibly more as Apple adds functionality to HomeKit. That said, Marshall's multi-room solution does have good sides. It is dead simple to use, just by toggling a button on the top of the speaker. When the light is in the "single" position, the speaker will act as a standalone device. When toggled to "multi", all Marshall multi-room speakers will play back the same audio, no fuss. This can be switched inside of the Marshall multi-room app as well, so it doesn't have to just be done on the speaker itself. When looking at the speakers through AirPlay, there is a bit of a change. When in single mode, each speaker has its own name and shows in the AirPlay menu. When switched to multi, each speaker will disappear and instead, a single new "Multi" speaker will appear in the AirPlay menu. AirPlay is super useful for Apple users. Nearly any Apple device - including the Apple TV, Mac, iPhone, iPad, and HomePod - can cast music to an AirPlay-quipped speaker. We played back a variety of different music through multi-room mode, including from our Apple TV, and tt worked surprisingly well though we did notice some dropped audio that would come out of one speaker but not the other. This happened infrequently and for less than a second each time, but definitely a few times during testing. Across the board, audio quality was very consistent. Each model had the same balance to it, just with different volumes. We also found more pronounced bass on the larger models, assuming it has a bit of room to breath around the back where the vent lives. When we increased the volume output to the max, which was very loud on the Stanmore and Woburn, we had no distortion in the quality, which is something we always check for in speakers. Oftentimes audio quality is sacrificed to creep out a few more decibels. In our tests, the Stanmore -- at max volume -- was far louder than you'd need for a normal sized room. Most people could probably get by with just the Acton, only moving to the Stanmore when a room is larger or more bass is wanted. Adjusting the audio quality with the knobs is not nearly as drastic as we imagined. It is actually much more subtle of an effect, allowing you to fine-tune it to your tastes, but not dramatically changing the balance of the audio. This is good as it shows Marshall's confidence in their sound. When you look at Marshall's target audience, the sound profile is clear. It is aimed squarely at those listening to predominantly rock or instrument heavy music with distinct vocals. Rap and hip-hop just weren't the exact genres these speakers were tuned for. It isn't to say they don't sound good, but they don't have the punch or sharpness we'd hear from speakers that aim towards pop and rap listening millennials. We did notice a huge difference in audio quality when moving between the Bluetooth input and Wi-Fi, with AirPlay clearly offering a much more crisp and lossless audio profile. Wi-Fi is definitely the way to go, with Bluetooth mostly an afterthought if you try to take the speaker with you and don't have Wi-Fi available. Marshall's lineup of speakers has been growing, originally with a full range of portable and non-portable Bluetooth speakers and now a lineup of Wi-Fi-equipped multi-room speakers. For those with the need to easily travel with their speakers, or even just Bluetooth as a requirement, their original models (Stockwell, Acton, Stanmore, Woburn) will fit the bill. On the contrary, any of the multi-room (Acton, Stanmore, Woburn) will be ideal for those who want a bit more out of their speakers. Both the Wi-Fi and Bluetooth models share the same names, so it is important to keep an eye out for which version of each model you are shopping for. Each model has subtle differences, though the biggest differentiator is the volume and output. Bigger models have additional inputs, such as the Stanmore and Woburn each getting RCA ports on the back. These speakers are clearly targeted to my music tastes. Rockers like Joe Walsh, Don Henley, Steve Miller band, all sound beautiful on these speakers, regardless of which model you pick up. Guitar licks sound clean and powerful and the physical knobs make it dead-easy to really tune your tunes to your tastes. 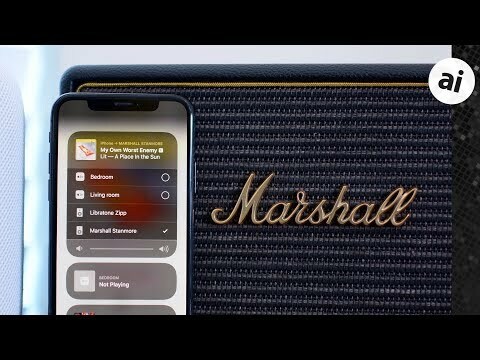 AirPlay 2 would be nice to have, and I'm hopeful that Marshall, and parent company Zound Industries, devices to implement it later through an update, but as-is these are fantastic speakers for rockers and other music enthusiasts. Their retro vibe is as eye-catching as it is nostalgia-inducing, making it almost as much a statement piece as much as it is a powerful speaker. Some may not prefer that look, but the list of modern-look speakers is a mile long, giving them endless other options. You've got many options when picking out any of Marshall's speakers. The Marshall Stanmore Multi-Room speaker can be found on Amazon or B&H for $449. B&H and Amazon also have the Marshall Acton Multi-Room speaker for $299. If you really want to increase the volume, the massive Marshall Woburn can be found for $599 on Amazon. None are much more than the Bluetooth counterparts, so we highly recommend the Wi-Fi models for those interested. Mutli-room, AirPlay, and better audio quality make up for the difference in price. Need help picking a wireless speaker? Check out AppleInsider's handy guide! You forgot to mention the Marshall Kilburn - which is a brilliant portable speaker. Amazing sound and fabulous looks. I play classical music and opera on mine - really loudly - and it’s like sitting in a concert hall. It's nice see Marshall getting some coverage. I've got the older standard bluetooth Acton and Kilburn speakers and they are terrific so if you haven't tried them before then these newer updated speakers sound well worth checking out. I buy one in a heartbeat if they made the knobs go to 11.